“From the Herd” new stamp set! 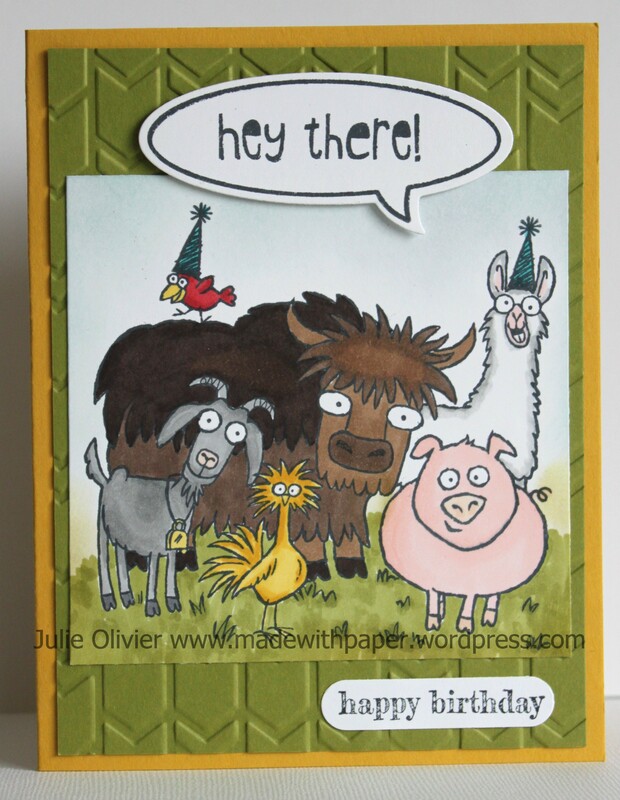 One of my favorite stamp set in the new Occasion mini-catalogue is the “From the Herd” set! It’s so funny!!! This set is perfect for a card from a group, a family card, etc! Look at those faces! They are hilarious! OK, I have to admit, it’s a bit of coloring, but so worth it! And did you know that coloring has its therapeutic powers? It can be really relaxing!!! I used my Blendabilities Markers to color the image. I really love those markers! 1. Cut half a sheet of Hello Honey card stock (5.5″ x 8.5″). Fold in half to form the card base. 2. 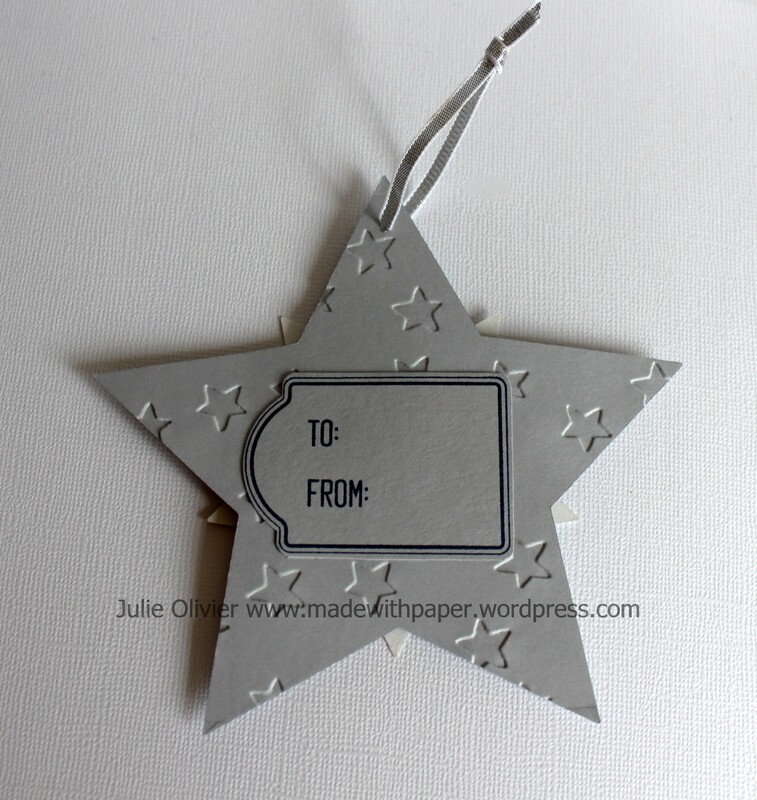 Cut a 4″ x 5-1/8″ Old Olive card stock. 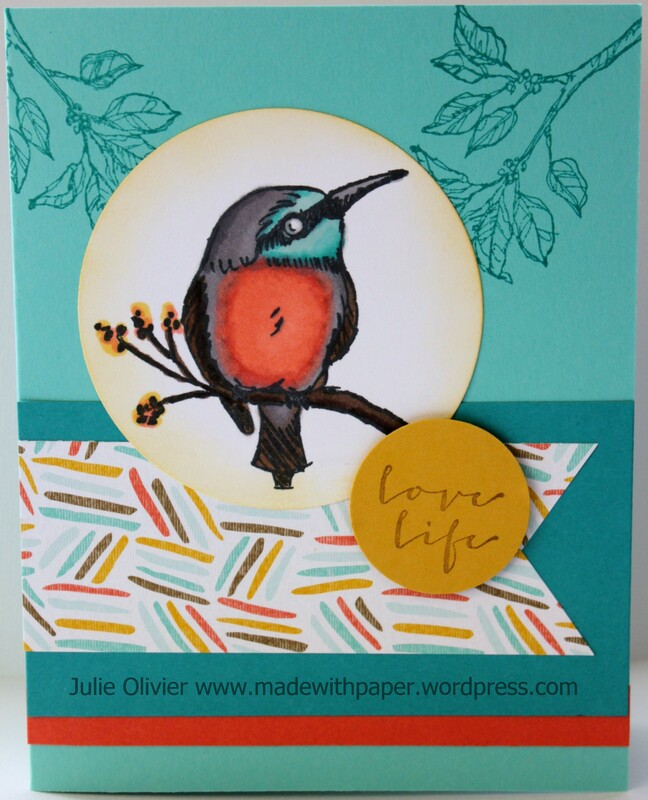 Run through the Big Shot with the Arrow embossing folder. Adhere on the card base. 3. Cut a 3-5/8″ x 3-3/4″ Whisper White card stock. Stamp the “herd” image. Color with the Blendabilities markers. (Always start with the lighter color and add the darker shade afterward. Sponge Soft Sky ink in the sky. Adhere on the card. 4. Stamp “Hey There” from “Just Sayin’ ” stamp set on Whisper White card stock. Cut with the matching Word Bubble Framelits dies. Adhere on the card with dimensionals. Stamp “happy birthday” from Something to Say stamp set and cut with the Word Window punch. Adhere at the bottom of the card. A good news I can finally share! Back in September, I was contacted by Stampin’up Canada to be one of the 4 designers for the Canadian Fall Conferences. 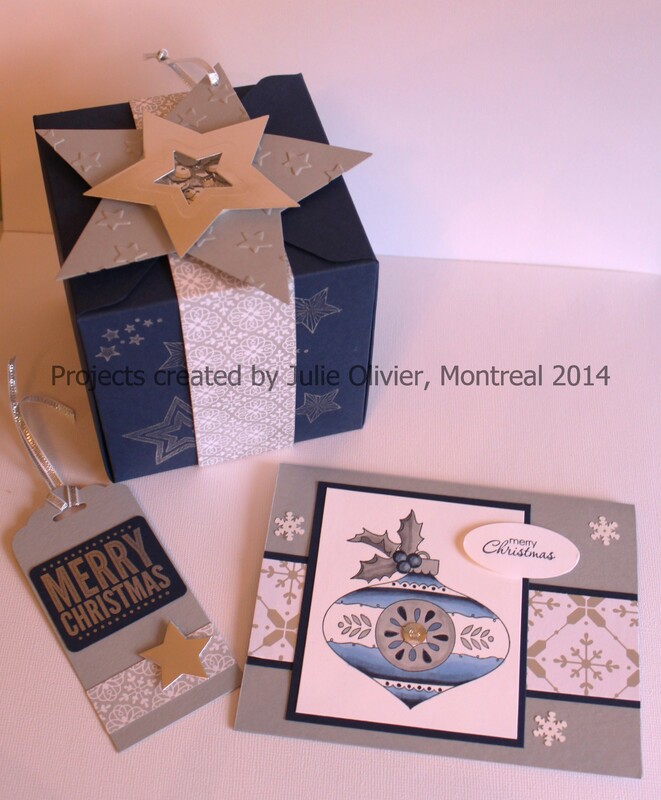 I was really honored to be chosen to design the Make and Take projects for the Montreal and Abbotford Conferences. The 2 sets I had to use was the “Christmas Bauble” and the “Ornamental pine” sets. The Montreal Conference was yesterday and Friday night (Oct.24-25). So the secret’s out! Here’s the Make and Take that they did on the Friday night. Come back tomorrow for the Make and Take they did on the Saturday! I decided to go with a Silver and Night of Navy color theme. It’s a bit unconventional, but I thought it was different and elegant! 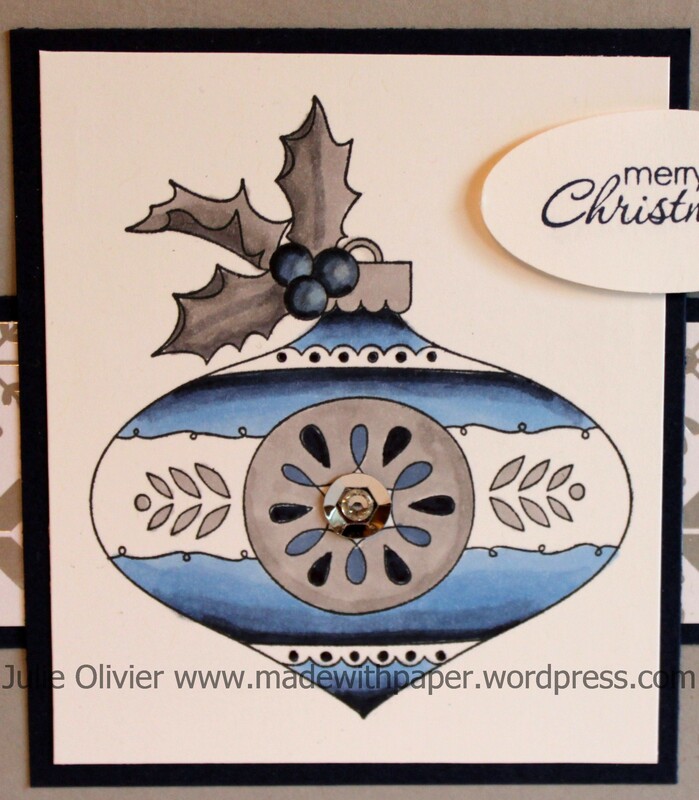 Here’s the card, featuring “Christmas Bauble” stamp, that I colored with the Smoky Slate and Night of Navy Blendabilities markers. In the center of the ornament, I glued a Silver Sequin (from Frosted Sequins) and a small rhinestone. I thought it really completed well the ornament. The Frosted Sequins also have some white beautiful snowflakes that I glued on the card. (Glue dots work best for those sequins!) Behind is a strip of the beautiful foil-embossed “All is Calm” Specialty Designer Series paper. Here’s the box and Star Decoration topper. 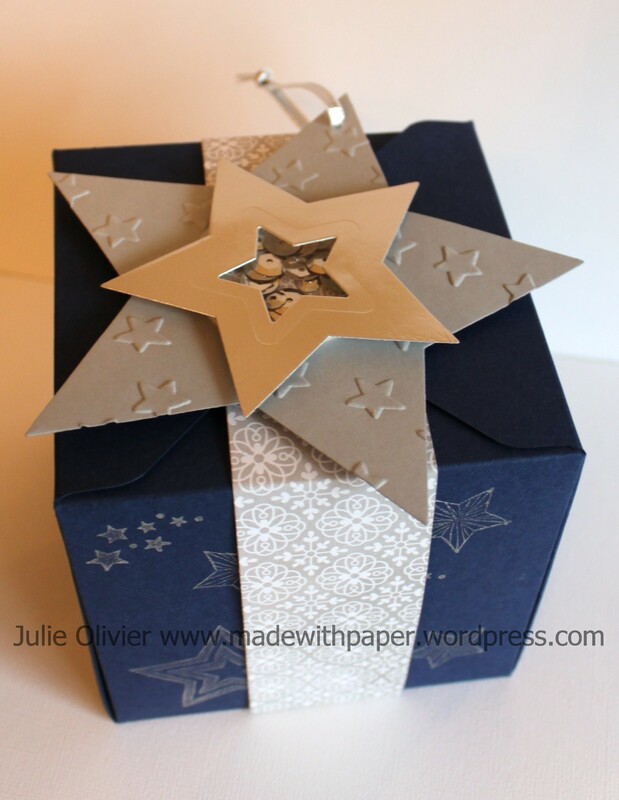 The box is made with a 12″ x 12″ Night of Navy card stock, stamped with stars from “Be the Star” stamp set in Silver Metallic ink. The box was made with the new “Gift Box Punch Board“. The gift box band is made from “All is Calm” specialty Designer series paper. Lastly is the Tag to complete this set. 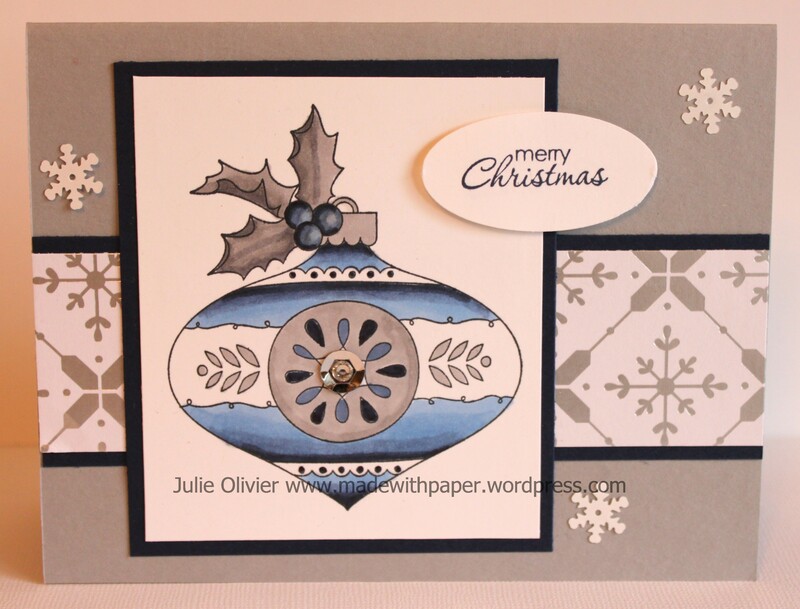 I used the Scalloped Tag Topper punch and the Merry Everything stamp set. 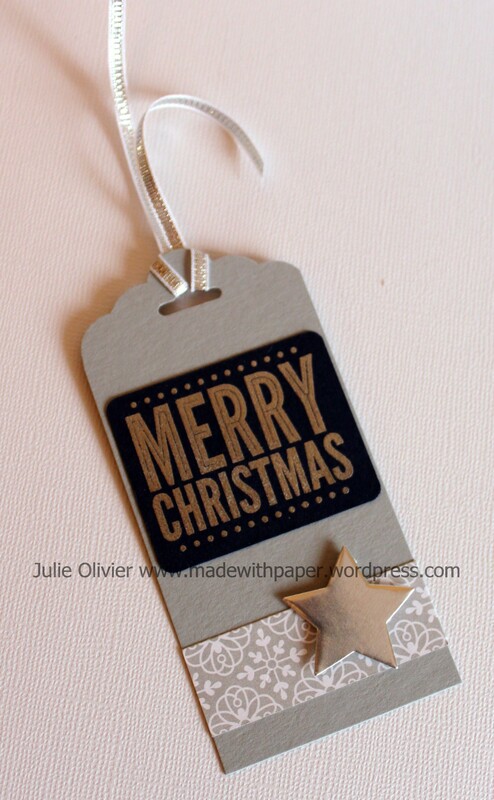 The “Merry Christmas is heat embossed with Silver embossing powder, on Night of Navy card stock. It’s cut using the Note Tag Punch (but I simply cut the rounded part with scissors.) 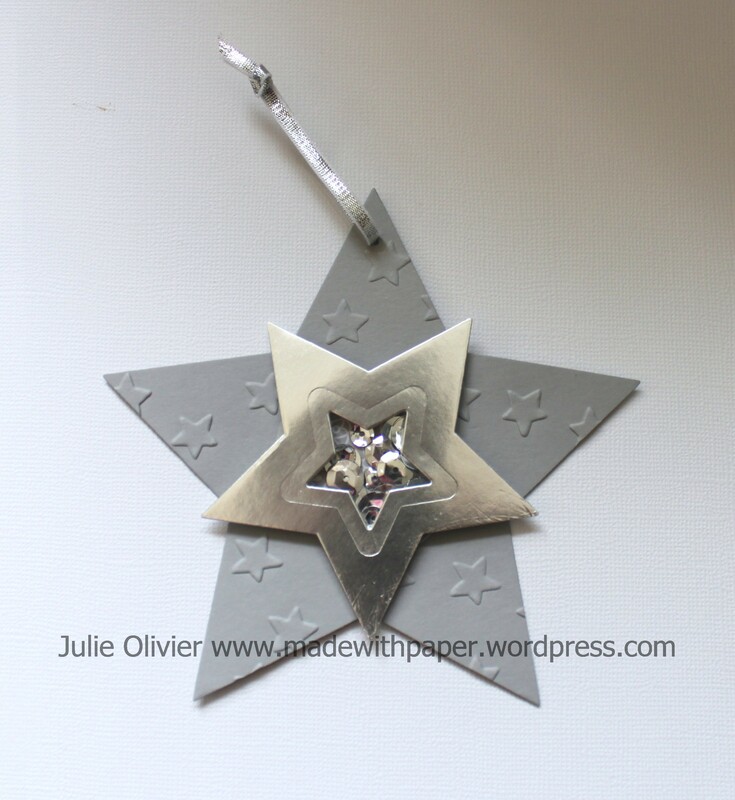 I used the little star from the “Star ornament” opening on the tag and a tiny piece of All is Calm DSP. 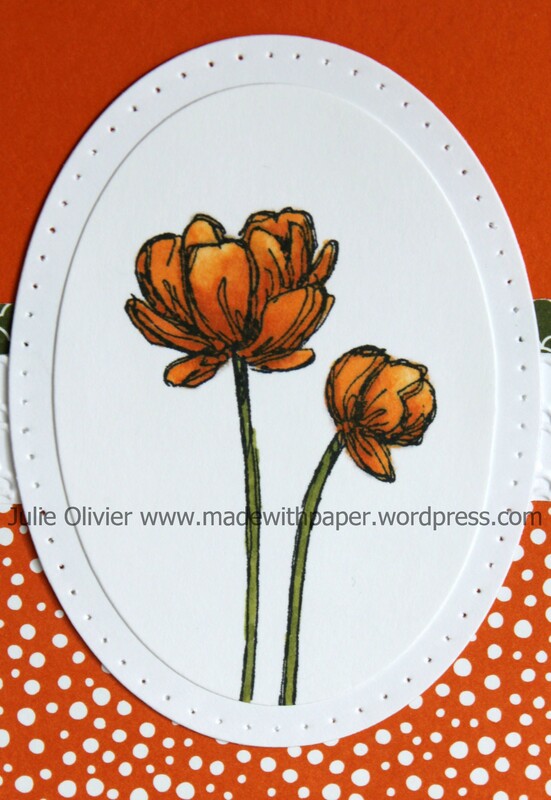 Today’s card is one that we’ll make at my Monthly Card Class this coming Friday, July 25 at 7:00pm. Today’s the last day to register! Please email me at julie_olivier@hotmail.com to register for this class. I used the beautiful Hostess set called “Bloom with Hope” (found on p.240 of the catalog). To get this beautiful set, you must host a stampin’up workshop or place a qualifying order of $200 or more. Contact me to book your workshop! The Fall is also the best time to start your Christmas cards! 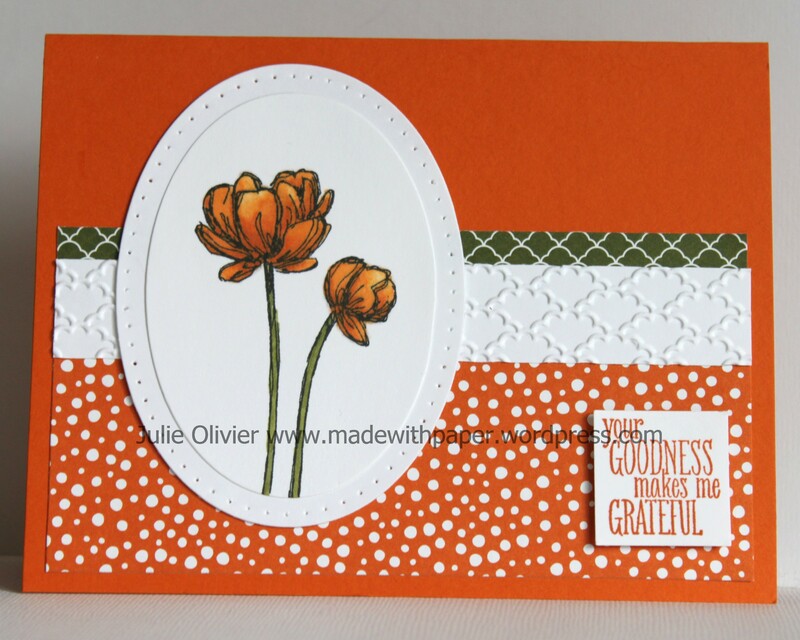 The background color for this card is the new Tangelo Twist In-color. I used a strip of Designer series paper (DSP) from the In-Colors paper stack, a strip of Whisper White embossed with the Fancy Fan folder and a large strip of “Confetti Celebration” DSP. Don’t forget that Designer Series papers are on sale until the end of July! Buy 3 packs and get the 4th FREE! See all papers on sale here! I used the Pumpkin Pie Assortment of Blendabilities Markers to color the flowers. These markers are so great! I love how you can achieve a shading effect so easily! Did you notice the little holes around my Oval? I used the Paper Piercing guide (Occasions set) with the Piercing Tool and Pierce Mat to achieve this without any fuss! I think it adds a nice finishing touch! New Blendabilities Markers are now available! The new Blendabilities are Alcohol ink markers made for blending and shading. Use with Memento Pad (below) for best results. (StazOn Black ink will “bleed” if used with alcohol ink.) They are Acid free and lignin free. Each pack comes with 3 markers (light, medium, dark) except for the Skin Tone Assortment which includes 6 markers. One great thing about these markers, compared to the regular Stampin’ markers, is that you can color on rhinestones, pearls, plastic, etc! Click here for more info and to watch a video on Blendabilities! 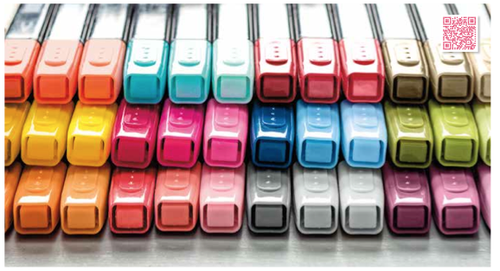 Memento Ink Pad $7.95 – Use with Stampin’ Blendabilities Markers. Tuxedo Black. Acid free. This is my “go to” black ink for ALL projects. Memento Ink Refill $6.95 – Refill: 0.5 fl. oz. Color Lifter – $6.95 Soften ink saturation by lifting color from paper. 1 lifter. Come try these awesome markers at my Stamping club night, July 15, at 7:00pm! Registrations required before July 11, at julie_olivier@hotmail.com. 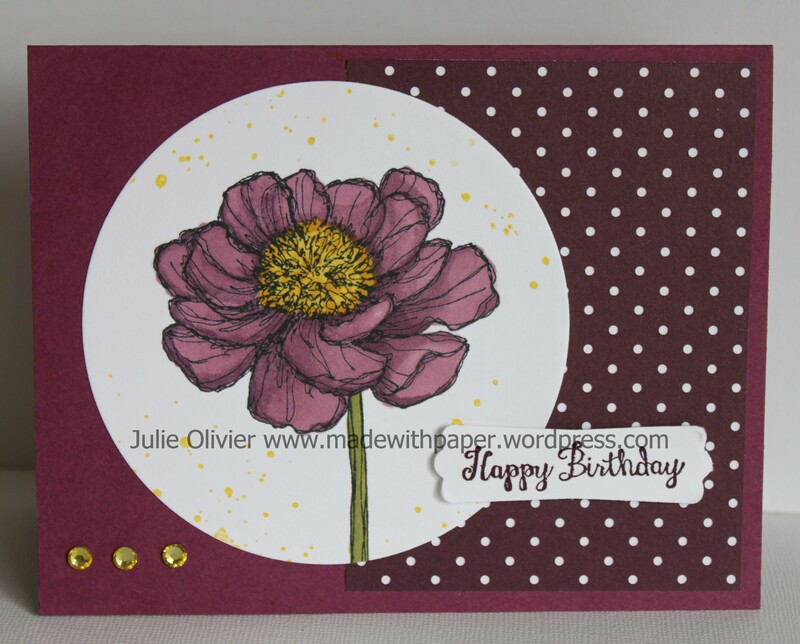 Here’s one card I made with the new Blendabilities and a new hostess set called Bloom with hope. Since every Markers pack comes with 3 shades of the same color (light, medium and dark), it’s very easy to color any flower like a pro! Turn it into a real “WOW” focus point on your card! I also colored the rhinestones with the Daffodil Delight Blendabilities markers to match the yellow already present on the card! This is so great! You can now get rhinestones or pearls any color!! !